The demand for increased production rates combined with more stringent quality objectives has resulted in a desire to reduce production costs and bring products to market quicker. One factor to be dealt with is the phase out of solvent based inks for labeling food items, bottles and packaging. Label adhesion, inkjet encoding, inspection, testing and packaging systems are all adversely affected by moisture left on the product surface. Following is a link to an article published about our work with Lions Brewery: http://www.packworld.com/casestudy-26848. Manufacturing plants with several processing lines can significantly improve the drying process and decrease compressed air usage and the associated utility costs by incorporating Sonic Air Knife Drying Systems. While some applications may be satisfied by "blow-off" from compressed air nozzles, they are not a cost effective choice for large coverage areas or when a high degree of dryness (90%-100%) is required. Sonics air knives often result in an energy savings of 50+%. The corresponding R.O.I. usually falls to within 6 months...just on energy savings alone! Today the ability of a production line to rapidly change over to another product, size or production speed is essential to remain competitive. 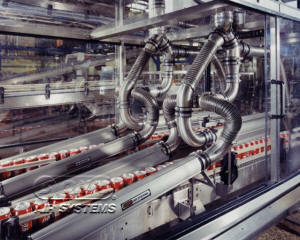 Sonics blower and air knife systems are specifically designed to accommodate all products that a food or beverage production line may be asked to handle. This is the industry that drove air knife drying to an engineered science. Prior to Sonic Air Systems, customers purchased high-capacity blowers and fabricated their own 'knives' or used industrial spray nozzles - often with mixed results. Sonic Air Knife Drying Systems provide a uniform high-velocity impact curtain of air that increases temperature about 40º F above ambient without the use of any type of external heat source. This heat increase is due to the friction associated with 30,000'+ exit air velocities. Sonics air knives and adjustable uni-mount brackets enable precise control over the air travel, enabling a degree of moisture containment. Sonic also provides an optional enclosure for the blower system to protect from high-pressure wash-down procedures. With food processors and packagers demanding that production lines run faster, occupy less space, be cleaner, have more flexibility and operate more efficiently than ever before. Sonic Engineered Blower and Air Knife Solutions, with their guaranteed performance, take a huge burden off the clients shoulders. Some examples are conveyor lines requiring surface water/moisture to be completey removed, coatings requiring precise thickness control, solids or debris that must be displaced or static eliminated. Sonic has set the standards for all. Sanitary air knives and HEPA filtration are also available options to handle the most stringent requirements. 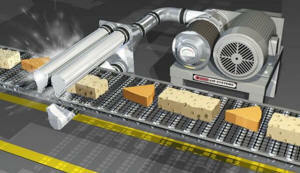 Some time ago a meat packaging company contacted Sonic Air Systems with a challenging drying applicaiton. They needed a way to dry packaged meat products prior to shipment. Removing water from the package surface was relatively easy, but the key challenge was the package sizes. Each cut of meat was a different shape and length - how can the efficiency of an air knife drying system be maximized? Rather than install the knife at a height that would allow the largest package to pass-by (inefficient for smaller packages) or requiring continual adjustment based upon the packages being processed (time consuming), this air knife system automatically maintains the optimal air knife height no matter what the package shape is. This enables the use of minimal horsepower and ensures a dry product. The self-adjusting air knife system can be applied to any application where target size varies. Sonic uses their global expertise to provide a system that is guaranteed to get the job done with the added bonus of a short R.O.I., energy savings and product flexibility.